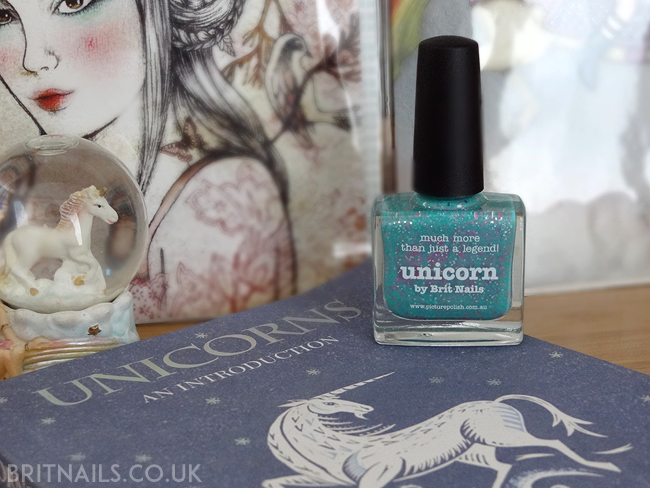 Introducing Unicorn - My piCture pOlish Collaboration Shade! Today I have some news that I've been keeping under wraps for just over a year - I'm very excited to finally be able to reveal my piCture pOlish collaboration shade! Ever since the original blogger collaboration shades were released, it's been a dream of mine to have my own; as any of the other collaborators will tell you, getting that email is so very exciting! There was only one name mine could possibly have, and so I introduce to you...Unicorn! I like to think of this as unicorn breath in a bottle! Inspired by my love of unicorns (you'll find various unicorn bits and pieces dotted around my house...what do you mean they're just a myth!?) 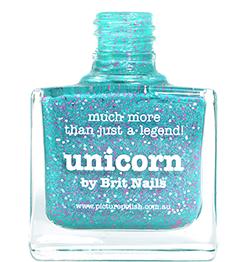 and my love of glitter, plus my favourite polish colour - turquoise. I really wanted to have fun with my shade, so I went all out! 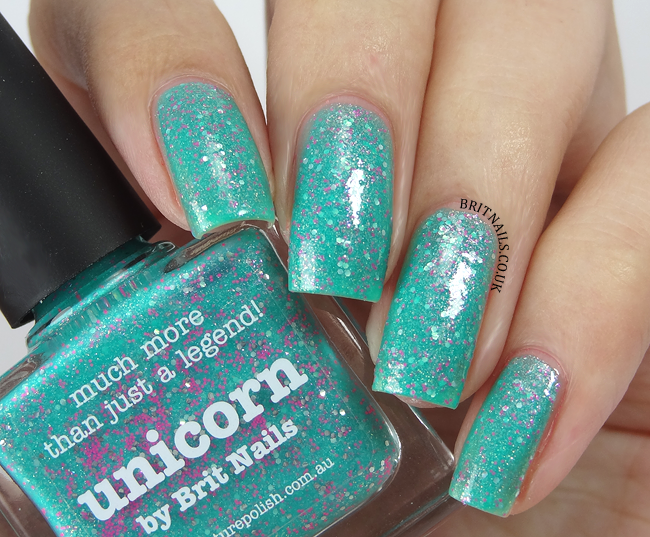 Unicorn is a glimmering turquoise base with a shot of pink shimmer running through it. Swirling around inside are lashings of bright pink and silver glitters, because there was just no way I wasn't stuffing my shade with glitter. The pink shimmer is beautiful in certain lights but rather difficult to capture on camera! 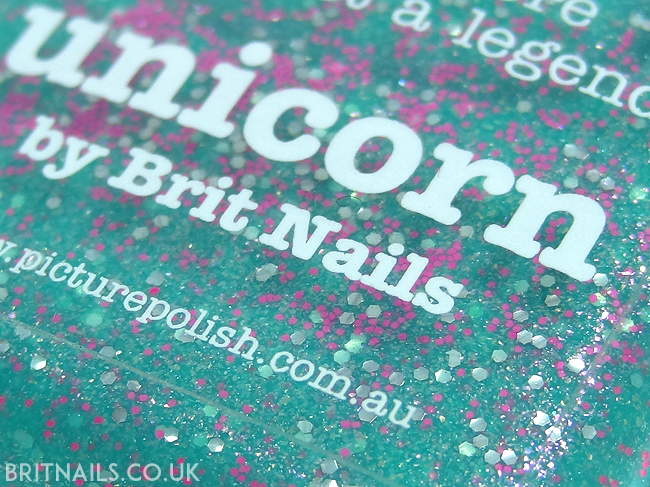 As it's a glitter shade, it dries ever so slightly rough to the touch, but smooths out nicely with a good top coat. The formula is a little thicker than some, but not a problem to apply; make sure to give it a good shake to loosen up all the glitter! In my swatches I've used 2 coats and top coat - get ready for some swatch spam! I really hope you love Unicorn! If you swatch it, please let me know by tagging me on Instagram/Twitter because I'd love to see. Thank you to the girls at piCture pOlish for being so great <3 I'm eager to see what other collaborations are being released today, don't forget to check them out too! - Check the piCture pOlish network page to see where they stock in your country! Congrats on your collaboration polish! It turned out amazing. It's incredibly gorgeous! I just love those pink glitters. Allie, this is just stunning! 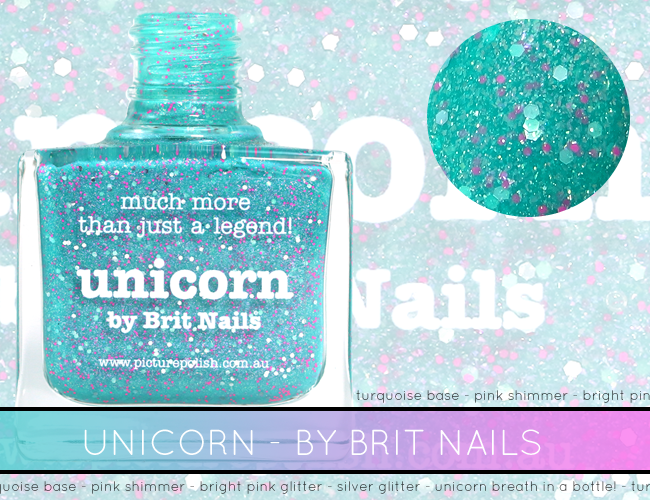 Congratulations :) Did you find the unicorn nail vinyls? oh wow that is just stunning!!! Fantastic colab, congratulations! I definitely will be buying that. what a gorgeous colour!!! i am totally buying it right away! This is so gorgeous! Congrats! Congrats Allie on getting your very own nail polish shade! I love the vivid combo of turquoise and pink. Thank you! So glad you like it, all the positive feedback is amazing! 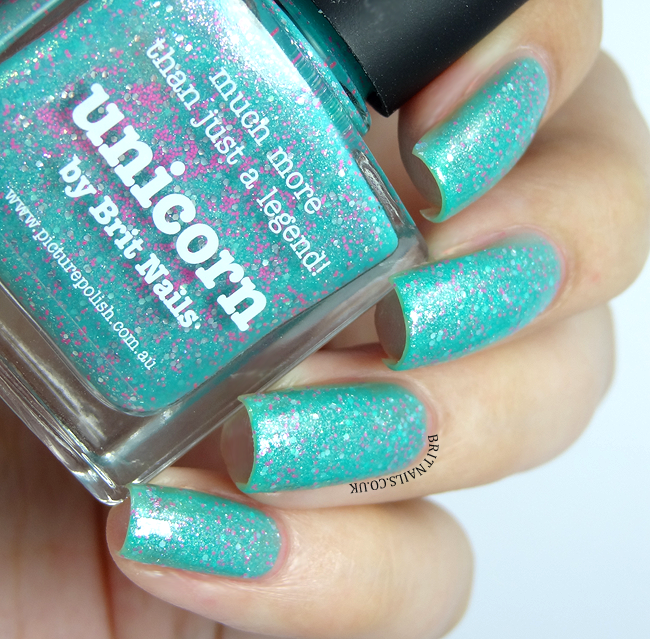 I got Unicorn today and I am trying to put it on my nails. The color is so pretty and tiny pink glitter, shimmer and silver glitter, this polish is really gorgeous! I love when Picture Polish combines the glitz of an other color than varnish. Very happy to have in my collection. There's something special about turquoise and pink...very well done!